Ben Hoadley holds degrees in bassoon performance from the Sydney Conservatorium of Music and the New England Conservatory (Boston, USA) and a Master of Music with First Class Honours from the University of Waikato (New Zealand) where he received the Lilburn Composition Prize. Ben studied also composition privately with Edwin Carr and completed coursework in composition at the Juilliard School. He has received fellowships to the Australian National Academy of Music, Tanglewood Music Centre and the Weill Music Institute at Carnegie Hall. Since returning from the USA in 2007, Ben has divided his time between Australia and New Zealand, drawing inspiration for his composition from both countries, particularly from the natural world and from the visual arts. This is apparent in his first major composition, the series of pieces for wind instruments, Manaia, written in 2008/9. Ben's compositions include: the chamber opera Miss Brill, written in collaboration with Sydney playwright Craig Brush, and premiered at the Art Gallery of New South Wales in 2018 as part of the Resonate series; Huia for organ and orchestra, premiered by the Auckland Philharmonia Orchestra; Turakirae for clarinet and orchestra, premiered by Peter Scholes and the Auckland Chamber Orchestra; and several works commissioned by the Sydney Omega Ensemble. His compositions have been recorded and broadcast by the Australian Broadcasting Corporation and Radio NZ, and for CD on the Atoll label. Waltz, Gavotte and Burlesque was premiered by the bassoon section of the Sydney Symphony Orchestra and premiered at the SSO's chamber series at St. James Church, King Street. Ben lectures at both the Australian Institute of Music and the University of Auckland, and is regularly invited to teach at institutions throughout Australasia and abroad, including a residency at the University of Louisville in 2017. 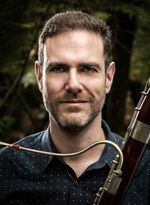 One of Australia's most versatile bassoonists, Ben has appeared frequently as guest principal with most of the country's professional orchestras, as a recital and concerto soloist and chamber musician. Ben has a special interest in Australian and New Zealand repertoire, regularly working closely with composers in the creation of new music for bassoon. Gillian Whitehead has written a number of pieces for Ben, which he has recorded on the Atoll CD Arapātiki , which was a finalist in the 2014 NZ Music Awards. Ben has also recorded the CD Southern Invention, featuring Australasian music for bassoon and piano. Ben premiered Alex Taylor's critically acclaimed bassoon concerto in 2014, subsequently performing and recording it with the New Zealand Symphony Orchestra. In 2017 Ben gave the Australasian premiere of Sofia Gubaidulina's Concerto for Bassoon and Low Strings with the Auckland Chamber Orchestra. Lurch : for solo bassoon (2016) Lurch was written for performance by the composer at a Dada-themed banquet conceived by Judy Millar for the Auckland Art Gallery Foundation in May 2016. Night Music : clarinet, viola and piano (2014) Commissioned by Sydney Omega Ensemble.